BelarusDigest > All > Who Will Get Positions in the New Government: Conservatives or Reformists? Who Will Get Positions in the New Government: Conservatives or Reformists? 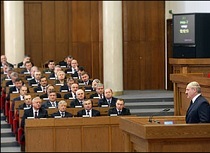 On 20 September, Alexander Lukashenka stated that he knew who was going to enter the new government. The previous government resigned, under Belarusian legislation, after Lukashenka's victory in the October presidential elections. The new composition of the government will expose the state ruler's agenda and on whom he relies. On the one hand, a new elite has appeared that resembles those in Belarus' European counterparts. On the other hand, the older nomenklatura still has great influence. A few ministries and government officials want change, at least in order to perform their job effectively. Others remain interested in business as usual. European-Style Nomenklatura vs Soviet-Style Nomenklatura? Over the past few years, new people have received top positions within the regime. This part of the Belarusian nomenklatura resembles European elites. It has more connections to the West, as these people previously studied or had job experience there. Many of them have a liberal economic stance, remain more open to independent media and are sympathetic to assertions of national identity. Two examples roughly reflect the new class. Kiryl Rudy was appointed economic adviser to Alexander Lukashenka in 2013. Before that he was a Fulbright Scholar in the United States, and worked as a lecturer and an economic counsel​lor in the Belarusian Embassy in China. This year, he gained a media profile with an article which called for structural reforms in the Belarusian economy. What’s more, his articles always quote Western mainstream economists. Vasil Maciusheuski previously led BPS-Sberbank, one of the largest private banks in Belarus, and studied at the London Business School. In 2014 he became the first deputy prime minister. According to the traditional state hierarchy, Maciusheuski comes in as the fourth most important person in the country. In his student years Maciusheuski wore clothes with a Pahonia coat-of-arms, the national symbol often associated with the Belarusian democratic movement. This class of people differs from the traditional nomenklatura, as they lack prejudices about the West and are quite young. Rudy is 37 years old and Maciusheuski 46. Both received top jobs in the elite largely due to Lukashenka's disappointment with the older nomenklatura, which appeared unable to rule the country in a crisis situation when financial resources were limited. Despite the popularity of a new class of nomenklatura in the media, most officials have more similarities with Alexander Lukashenka. They remain inconspicuous, but in practice they form the backbone of the Belarusian nomenklatura and appear in the media only in the context of scandals surrounding the president's work. The old nomenklatura elite are rarely engaged in creative work, and instead repress citizens and public institutions. Mariana Shchotkina, Minister of Labour and Social Protection, moved to Belarus only after finishing her studies in St. Petersburg. She headed the campaign headquarters of Alexander Lukashenka during the recent presidential election. She differs from the usual people engaged in social protection: she does not defend ordinary people, but attacks them. She advises the retired not to complain about low pensions, regrets that 93% of Belarusians have only one job, considers $10 unemployment benefits as normal and strongly defends the law on "social parasitism", according to which unemployed people should pay tax for being unemployed. When Lukashenka dismissed Leanid Huliaka from the post of Minister of Culture, he promised to find him a job where he would fulfil his potential better. In 2005, Leanid Huliaka, now 66, who graduated from the Party School of the CPSU in Soviet times, became a Commissioner for Religions and Nationalities. In this post he has tried to prove that Poles experience no problems in Belarus, and that the Independent Union of Poles does not exist. Huliaka also has a tense relationship with the Catholic Church and accuses foreign clergy of being politically active. As Alexander Lukashenka stated on 20 October, "now it seems impossible to carry on in the old way". So that creates a demand for new faces. On the one hand, the structures that are most in favour of change already look more Westernised. These are the National Bank and parts of the government, which essentially counts the money, such as the Ministry of Finance. The Ministry of Foreign Affairs, which understands global trends better due to its work, also seems more pro-reform. On the other hand, a few officials want business to stay as usual. The state concerns and several ministries as the Ministry of Commerce, remain best placed for those who want to increase government spending and have more competencies in the own hands. For example, the Ministry of Commerce usually uses licencing as a tool of repression and closed down several shops in 2015. There’s an inert part of the regime that, basically, does not oppose changes but does not promote them either. These are ministries and local government officials who want, for example, foreign investment, but seem reluctant to attract these investments on their own. Who Will Get Jobs in the Government? Lukashenka faces a dilemma in choosing people for the new government. On the one hand, he has to thank his conservative loyalists for the support during the presidential campaign. That explains why such persons as Mariana Shchotkina may receive high positions – if not in the government, maybe in the Presidential Administration. On the other hand, Lukashenka understands that his loyalists may further damage the Belarusian economy, which remains in desperate need of reform. So, reformists like Vasil Maciusheuski may save their positions. If Lukashenka wants reform, he will also give more portfolios to the European-style nomenklatura — if not to reform, then at least to charm the International Monetary Fund or the European Union. Taking this dilemma into account, Lukashenka may create a mix of conservatives and reformists. Currently he needs both to preserve his position. The award generated mixed opinions in Belarus, with some political activists and literary critics questioning Alexievich’s Belarusian identity because she writes in Russian. In Russia itself some disowned the writer for criticising Putin’s policies and called the decision political. Such divergent reactions to Alexievich’s work reflect deepening divisions in post-Soviet space and betray Belarusians’ insecurities about their national identity. Alexievich is the first Belarusian writer to receive the prize, which places her next to such world-renowned writers as Albert Camus, Gabriel García Márquez, Ernest Hemingway, and Boris Pasternak. She will receive the $960,000 prize in an official ceremony on 10 December. Her first two books focus on the memories of World War II. In The War’s Unwomanly Face (1985), Soviet women share their experiences from the front lines. People who survived the war as children tell their stories in The Last Witnesses: the Book of Unchildlike Stories (1985). In Zinky Boys (1989) readers hear from former soldiers as well as the mothers and widows of those who returned in zinc coffins from the 1979-1989 Soviet war in Afghanistan. In Voices from Chernobyl (1997), we hear stories of the people scarred by the worst nuclear power plant disaster in the world, which contaminated one fifth of Belarusian territory and killed or sickened nearly half a million Belarusians, Russians, and Ukrainians. Alexievich’s most recent book, Second-Hand Time (2013), presents individual narratives about the Soviet past, recorded by the writer throughout the 1990s and 2000s. Yet not all Belarusians celebrate Alexievich’s victory. Some criticise her for writing in Russian and for covering Soviet rather than Belarusian history.​ Zmitser Dashkevich, a leader of the Young Front opposition movement, reacted on Facebook by asking: “Will Nobel Prize finish off Belarusian culture?” He claimed that “while Nobel laureates bark, the language continues to live!” Belarusian writer Sviatlana Kurs in a Belsat interview said that, as a “fully Belarusian person as far as the language and culture are concerned”, she would have been happier if a Belarusian-language writer had won the prize. 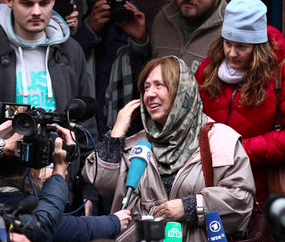 Paradoxically, Alexievich incurred even more criticism from the Russian side, although she did receive congratulations from Vladimir Grigoriev, Russia's deputy minister of the press. Alexievich’s attitudes toward the Russian government and support for the Ukrainian side in the conflict angered some Russian critics. Dmitry Smirnov, a reporter with the Kremlin Presidential press pool, tweeted that Alexievich won the prize for “hating Russia.” Vladimir Sungonkin, the editor in chief of the Russian tabloid “Komsomolskaya Pravda”, claimed in a 9 October interview with Echo Moskvy that anti-Russian attitudes helped Alexievich win the award. Alexievich’s biography speaks to the fluid borders and complex identities in post-WWII Eastern Europe. The writer was born in 1948 to a Belarusian father and Ukrainian mother in what is now the city of Ivano-Frankivsk in Ukraine. Alexievich’s family then moved to Belarus, where the writer grew up, studied, and worked. When asked about her choice to write in Russian at a press conference with Nasha Niva on 9 October, Alexievich explained, “I am writing about a man-utopia, a red person. This utopia lasted for 70 years; another 20 years are spent on getting away from this utopia. And this utopia spoke Russian.” Indeed, heroes of Alexievich’s books are Belarusians, but also Ukrainians, Russians, and Tatars. They all are products of the Soviet system and their shared Soviet past obscures their ethnic identities. At the same time, Alexievich expressed gratitude to her teachers, Ales Adamovich and Vasil Bykau, both of whom wrote in Belarusian. She also said that while she loved the world of great Russian literature and ballet, “the world of Putin, Stalin” was not her world. In some sense Alexievich’s work is much more representative of Belarus than the work of many Belarusian-language writers. In the 2009 Census, 70% of Belarusians declared Russian "the language spoken at home.” Alexievich’s use of Russian reflects this reality of today's Belarus.